I got an email earlier this week from J&R notifying me that they’d gotten the new Red Sony Reader Touch Edition in stock. So today I went in to fondle it. 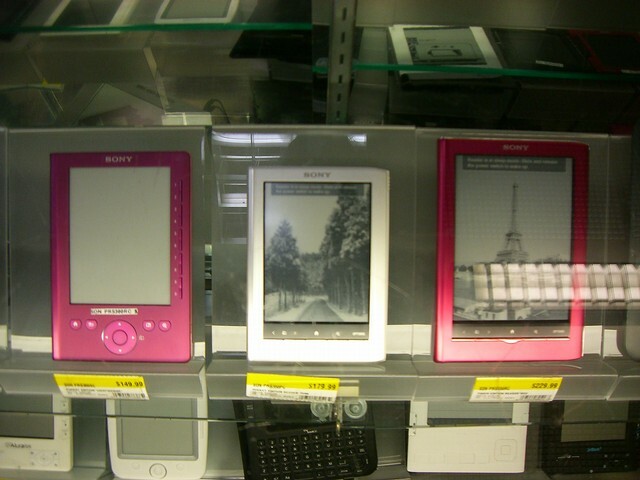 That’s the previous model, the PRS-300, in Pink; then the new Sony Reader Pocket Touch PRS-350, in silver; and the new Red Sony Reader Touch Edition PRS-650. I asked to fondle the Pocket Touch first. It was lust at first touch! It weighs nothing!! The Sony Pocket blew it away. It feels incredible in the hand. Perfect balance. The front is smooth and the back has a slight grippy feel to it. Some people have carped about three sides of it being white plastic, but hey, if that shaved some more weight from it, then good! Trust me, even the plastic sides — which you’ll hardly ever touch — feel good. This is an exquisite piece of tech. Every bit of it screams Quality. This is really the old Sony at work here. The original Pocket Edition looked like a nightmarish RoboBook. This new Touch brings the design of the 6″ version down to the Pocket. And it really, really shines in this size. And this baby is speedy. It must have the same CPU and speed as the larger Touch Edition (which I also fondled; more later). Sony learned from the lumps it took about speed — as in the lack of — from the prior Pocket and didn’t skimp this time. They did it right! There were some sample book excerpts on it — from real books too. Not recycled public domain stuff. That’s XS — extra small — which I’m damned sure I’d be using if I was young again and didn’t need reading glasses as I do now. I’ve read paperbacks with type that size. It’s perfectly readable too. But most important of all — it just screams Book! That’s S — small — which I could easily read. It too just screams Book! And that’s M — medium — which I’d likely use when I don’t want to put on my damned glasses (well, I’d probably have to put them on any damned way, because everything blurs up on me now close-up, dammit). It still screams Book! I didn’t try all of the features. Just briefly tooled through several things to test for speed and screen responsiveness. And that screen is responsive! There’s a video on YouTube showing page turns being done with the touch of a feather. And it’s true! The lightest swipe will turn the page. Same for selecting menu items and closing dialog boxes. Beautiful work, Sony. I didn’t find any delays in using at all. Speedy — totally unlike its predecessor. And the screen — eInk Pearl — really pops out of the silver frame. — it felt like a device in my hand. And I wasn’t keen on the new red, it tends more towards pinkish than the original metallic red the 505 had. Also, this surprised me, the eInk screen didn’t pop out against the red as it does with the silver (and as it did with the original Red 505). Another surprise was the ability to change the contrast of the eInk display. I figured this would only be necessary for hinky PDFs. Not so! One of the presets I chose really made the eInk pop even more on one of the sample ePubs. It was a revelation. People must be finding this thing easy to use because the Coben sample was highlighted all to hell. I actually had to delete a partial highlight of the first sentence for my photos. That was easy to do. I didn’t try dictionary lookup or freehand notes or even bookmarking. This was brief fondle for my own impressions. Besides, others have already covered that ground in reviews and YouTube videos. The size of Pocket makes it intimate. It feels like a book, like handling a very light mass-market paperback. And I could easily see this fitting into an inside jacket pocket without any problems at all. I don’t know how to really convey the intimateness of it. It’s really unlike all other eInk devices I’ve fondled. The Cybook Opus weighs just about nothing. This is because everything is plastic. And it feels like cheap plastic too. Like disposable device cheap. Like drop it and it’s d-e-d cheap. Like this thing won’t last several thousand page turns on that too-small center clickwheel and those funky right-side twin page buttons. All that for a whopping US$229.00 too! If it was only US$25.00, it’d at least match the feel of the device. Let me tell you, the Sony Pocket experience is nothing like that. It’s built solid and I’d expect it to last. And the feeling of intimacy I got from the Pocket wasn’t there with the Opus at all. I really do think that even though it irritatingly lacks any wireless capability whatsoever, the Sony Pocket Touch is the best damned eBook reading device now on sale. Once you’ve held it in your hands, it feels right in a way not even its larger sister, the PRS-650, feels. And it makes the Amazon Kindle 3 seems like a damned aircraft carrier by comparison! I couldn’t ever see myself just being able to plop the Kindle in any pocket I own. I’d need to always have a separate shoulder bag with me. The Pocket is really a bring-along device without having to plan for bringing it along. 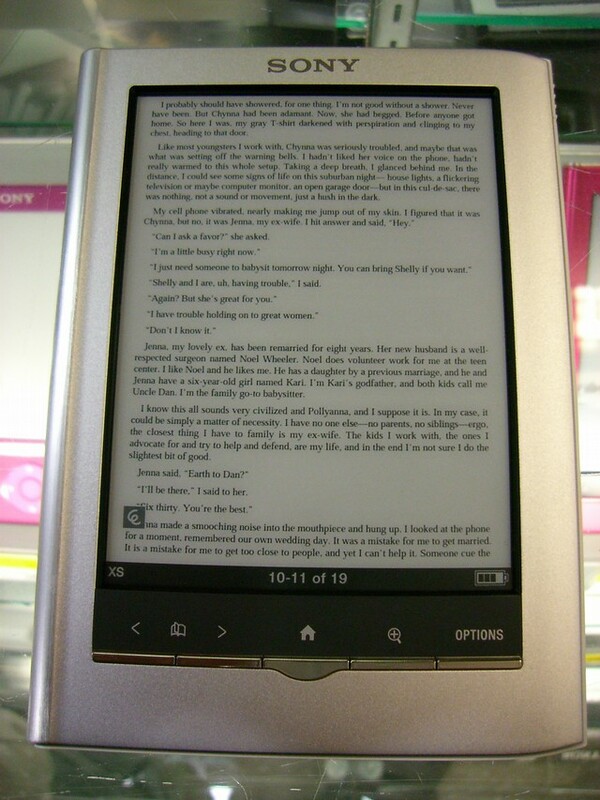 That’s how I think eBook devices really need to be, now that I’ve finally seen one that does that. Aluratek Libre: 6.0″ x 4.25″ x 0.5″ – 8 oz. I went into Borders today, after fondling the Sony. 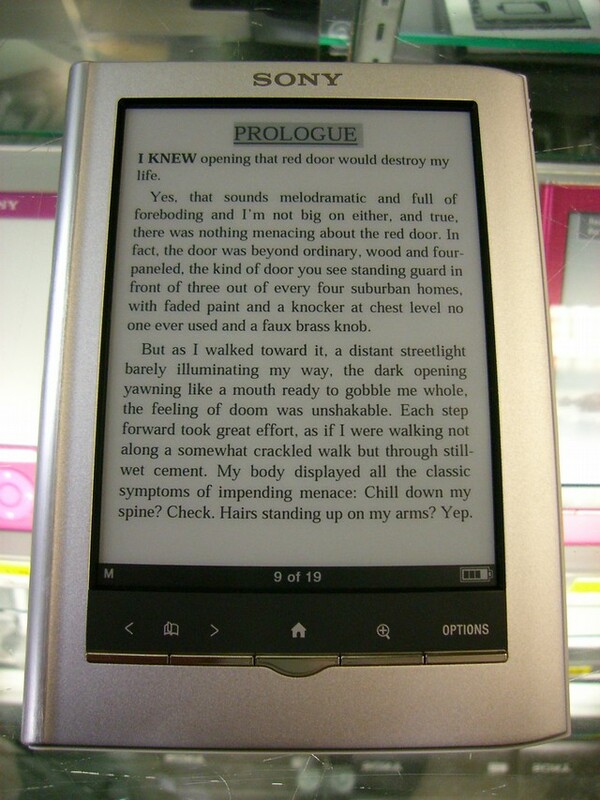 I tried the Kobo Reader again (newsflash: the Sony’s screen slaughters it now) and made sure to hold the Libre. There’s no other word to use for the Libre: Garbage. Rotten plastic, bizarre angles on the back (which is not flat), a cheap feel, and no sense of being right. 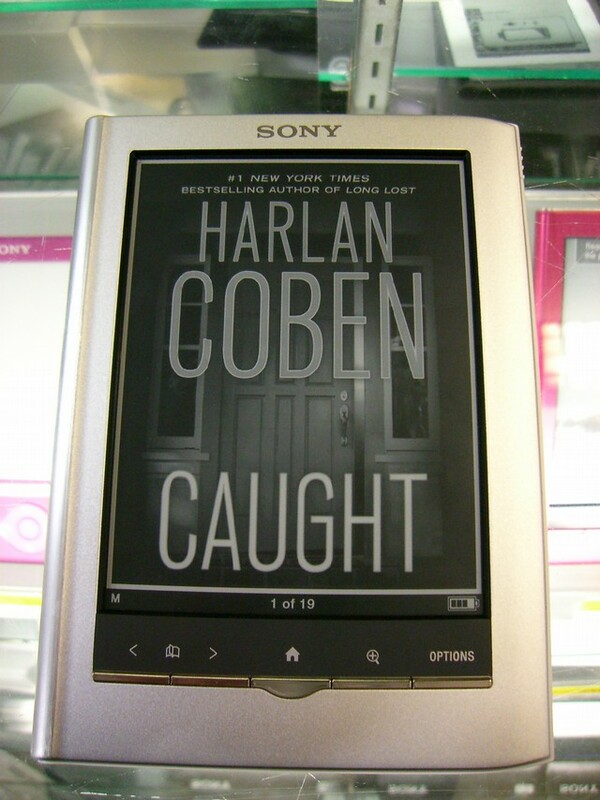 The Sony Pocket Touch is really making me re-evaluate my decision to buy a Kindle. I never expected this to happen. None of the videos I saw on YouTube excited me like touching it, holding it, reading from it did. I’m thinking now I could buy the books available only for Kindle, DRM-strip them, and format convert them to ePub. This is an experiment I’ll have to test. Having wireless would make the Sony Pocket Touch perfect — but for right now, it’s the one device I’d really really really want to carry with me all the time and read on. Well done, Sony. I just hope you will speed up your development process and introduce the same one in less than six months with WiFi and 3G at the same price or even less. It’d be absolutely perfect. It’s the smaller 350 that I lust for, but I’m glad you like your new 650 too. Evelyn has had a Sony reader for the past 2years. At first she loved it. However as of about 6months ago something changed with the Sony store ( the only way to buy books for the reader) and now she is not able to get books that she could in past. It seemsnow many new releases that are available in the US are not available in Canada. Probably the Canadian government stepping in to protect some buddies with a printing press and book store. She now must wait several weeks for new releases to be available. Ev also tried the library’s new digital service. Once you request a book it can also take weeks for it to be available. Ev has become increasingly unhappy with her reader and has begun buying books again. Maybe that was the GOC plan. I doubt it’s Sony’s fault. There are still territorial rights for books, a legacy from when printing them ruled the world. But usually rights are sold as a North America bundle, which includes Canada, so this is very strange. I’d email Sony — several times, if need be — to find out what’s up. And yes, public libraries have to buy “copies” of eBooks just like printed ones. Right now, they buy far fewer eBook editions than print ones, so this can involve a waiting list. Most libraries will send an email notification when a book is available, however. 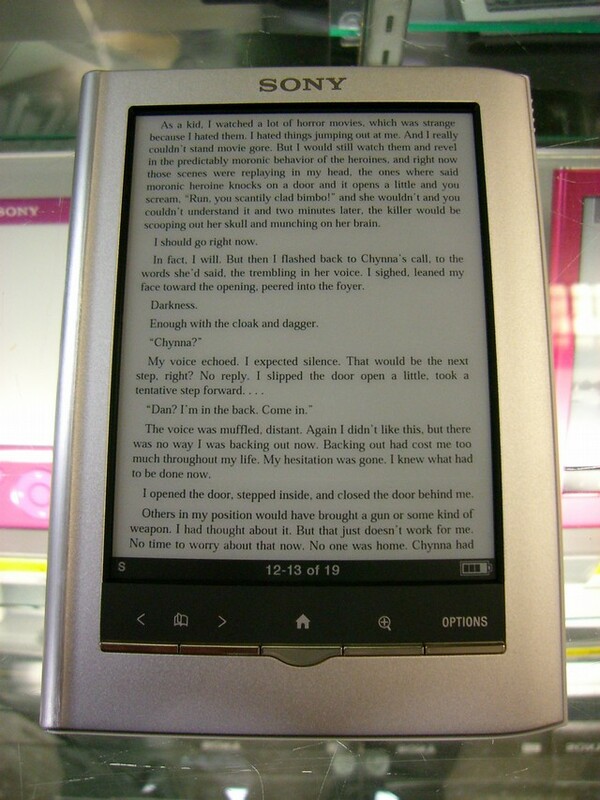 Did you manage to get books from Amazon into the Sony? That can’t be done legally. Kindle uses a totally different file format. Unless the Kindle book has no DRM, it can’t be format shifted using Calibre to ePub for Sony or Kobo. At least not legally.